If you’re heading to Colorado for your summer vacation this year, or you’re just wishing for a day away in the mountains, AVA’s Zipline courses are perfect for you and your group. The Mountaintop Zipline in Buena Vista is equipped with 7 lines that will send you flying through the treetops over Colorado’s Arkansas Valley. If you’re staying in Denver, head west just thirty minutes to our Idaho Springs outpost where you can soar along the cliffside and catch incredible views of the Continental Divide. AVA’s packages are perfect for your summer adventure, where you can combo multiple exhilarating outdoor activities for an action-packed day in the Colorado Rockies. 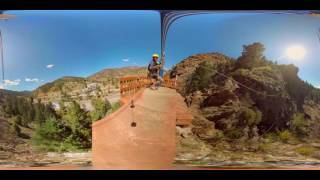 This perfect summer activity will have you enjoying some Colorado sunshine above the quaint mountain town of Idaho Springs. Start your morning off along the cliffside, then enjoy some delicious food or a cold beverage downtown Idaho Springs, just half a mile away from our outpost. If you’re heading to the Denver area for your summer vacation, AVA’s Idaho Spring outpost is an ideal adventure destination. 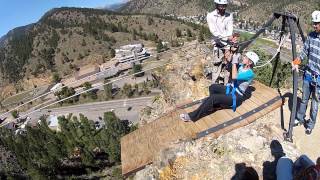 Our Cliffside Zipline and Via Ferrata tours are only 30 minutes west of Denver, Colorado on I-70, and they are both perfect for groups of all sizes. If you’re interested in an after-dark adventure, try the Cliffside Zipline under the Milky Way on our Starlight Zipline Adventure or Full Moon tours. Head deeper into Colorado’s Rocky Mountains to our Buena Vista outpost, located just over two hours southwest of downtown Denver. The Arkansas Valley is full of the most thrilling outdoor adventures, including whitewater rafting, rock climbing, and ziplining. Our Mountaintop Zipline course is situated on 44 acres of undeveloped mountainside, leaving you flying among Colorado’s wilderness and loving every minute of the warm summer months. If you don’t want to limit yourself to just ziplining, both our Idaho Springs and Buena Vista outposts have some of the best adventure packages in Colorado. Combo two activities into one day and make some lasting memories with AVA. Via Ferrata is new in the adventure game, so many aren’t aware of what exactly this activity entails. Long story short, it’s an exhilarating combination of traversing your way along a cliffside via iron rungs with rock climbing elements incorporated into its course. You get a taste of multiple different activities packaged up into one! Based on the cliffside in Idaho Springs, this 1/2 day adventure will have you journey with your experienced guides back down to AVA’s outpost along Chicago Creek. Suspended bridges, a rappel down a 70 foot rock face and even a few ziplines are integrated into this cliff traversing course, and it will challenge you on all levels! No experience necessary. Moderate to difficult physical activity. Colorado’s summers can get pretty toasty especially being a mile closer to the sun, but expect July and early August to bring frequent afternoon rain showers. You’ll want to have your base layer be a tank top or t-shirt in case of warm, sunny days in the mountains. Have a sweatshirt handy in case some clouds roll in. A waterproof jacket would be smart to have in case of rain showers. A water bottle is much needed, as the elevation here will dehydrate you faster than you think and the Colorado sun can get quite balmy come mid afternoon. Bring one that you’ll be able to clip to your harness! You’ll meet thirty minutes before your trip time at either our Idaho Springs or Buena Vista outposts. After filling out your waivers, we’ll get you all geared up and teach you the in’s and out’s of properly ziplining prior to taking you up to the course. If you’re taking on our mountaineering Via Ferrata tour, the grounds course takes a bit longer and you’ll do a few practice runs up on the cliffside before you being traversing. Once your activity concludes, you’ll head back to our outpost and have the option to buy some pictures from your adventure.